Imagine... a personalized keepsake inspired by your loved one’s touch, sculpted and handcrafted into precious metal jewelry. Designer Virgil Amaral of Forever Touch Studio can provide you the gift of a lifetime. “I have found my passion. As a Classically Trained Jeweler, I learned the Art and Time-honored methods of Fine Jewelry making and continue to practice them today. In the shaping and sculpting of fingerprint impressions, however, I put aside these methods and rules to allow the beauty and uniqueness of each impression to unfold. My mission is to stay true to the fingerprint impression because it is the most significant part of the piece. My passion is to bring out the visual energy of each individual impression and craft that impression into wearable art. When completed, the piece has a natural energy that pleases the eye and generates a sense of well-being. These distinctive, one-of-a-kind jewelry keepsakes are custom created into charms, pendants, cuff links, key chains, and more. A truly extraordinary gift to give or receive for all occasions, such as Christmas, Mother’s Day, Father’s Day, Birthdays, Anniversaries, or any other Special Occasion. There is no greater gift in life than to have your loved one’s touch with you to treasure forever. Forever Touch Studio will capture that meaningful touch for you and sculpt it into an original and personal piece of fine art fingerprint jewelry. 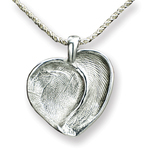 Each timeless keepsake is custom handcrafted into Sterling Silver or 14-Karat yellow or white gold jewelry, made from the fingerprint impression of your precious newborn, child, parent, grandparent, grandchild, or any loved one close to your heart. Contact Forever Touch Studio to create that special gift of a lifetime!